My early work focused on the figure but after moving to Idaho in 1992, I became fascinated with capturing the diverse landscape the state had to offer. I purchased a French easel and oil paint, escaping to the outdoors to paint every chance I could! For the next 15 years I worked on good composition, color, values and qualities of light. Painting on location teaches you to simplify and make quick decisions as you only have an hour or two before the light changes. These lessons became my best tools as I started to work in my studio later on. I invited some like-minded artists to join me and the group evolved over the years into the Plein-Air-Painters-of-Idaho. We enjoyed painting in the Sawtooth Mountain area, the Snake and Salmon Rivers, Alpine Lakes, and numerous farms and ranches. It was the most exciting time in my career. 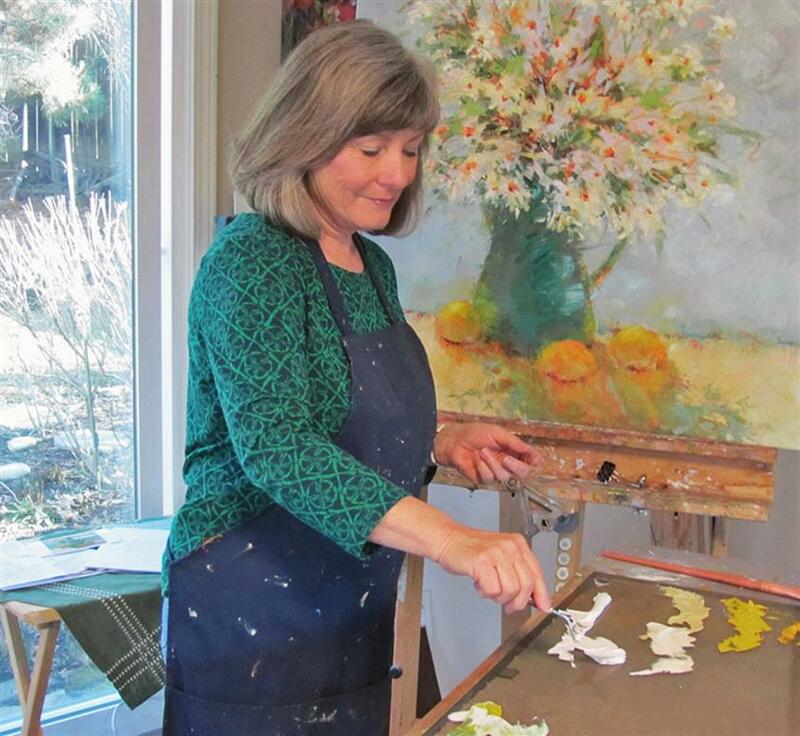 Over the years I began spending more time in the comfort of my studio. Using what I learned painting on location, with my field studies and memory I found a new direction in my work. My art became more expressive and imaginative on much larger canvases. It continues to mature to my surprise. After spending time showing my work with galleries across the country and outdoor shows, I decided to simplify my life. I work with only a couple reliable outlets now and my own client base, focusing less on quantity and more on the quality of my art and the fun of it! This allows more time spent with my family, grand-children, gardening, hiking and travel. I texture the canvas, then brush on thin transparent color. I continue to add thicker paint using brushes and palette knives. I plan my painting ahead using sketches, a value pattern, and color choices. Then I allow intuition and spontaneity to take over, enjoying the process. I could not be happier with my new artwork. I've had my eye on Ms. May's UGallery works for a while and this piece fits my new home perfectly. I have always purchased from traditional galleries so I was a bit apprehensive about buying online. But the free return policy convinced to to give it a try and I'm 100% satisfied!! Thank you Tricia May for creating this lovely work. My wife, Jane, and I love looking into those woods. Beautiful! Sunlit Jewels arrived yesterday. I am over the moon. Just gorgeous! Absolutely love it. It is even more beautiful in real life. I ordered another piece of your from Crate and Barrel. I didn't even realize they both were yours until this one arrived. I am a fan! Thank you Richard, Within a 200 mile radius of Boise there is such a variety of landscapes to paint. Add the four seasons and the opportunities are endless! I am currently working on a foothills scene and hope to have it completed soon. Boise is growing so fast but it is still a great place to live. Come back to visit! Tricia, you are very skilled at painting! I love your outdoor scenes involving trees. Your work is gorgeous. - Richard Adams P.S. I grew up in Boise, Idaho, and I often miss that area. I just returned from my annual plein air painting trip to Stanley, Idaho. The surrounding landscape including Redfish Lake is so inspiring. I willl be posting some new paintings soon! Marie, I meant makes a difference (not mades). I never was good at spelling! I love your paintings so very much. I hope you realize how much your work touches peoples' lives. It gives me peace and brings back memories. Thank you. "French Lavender" was delightful and I am so glad that I have it in my budding art collection. I certainly will continue to follow your work. The colors are so vibrant and bring out the fullest in all your landscapes. Cheers! Oh, they are beautiful. I bought them for my son's first home. I cannot wait to get the frames and hang them up with him. He loves the choice I made. Thank you , You have a gift !!!!! Tricia again today a received a complement on my(your)painting. we love to stand back and admire how all the colors you used come together so perfectly. I will enjoy this painting for a long time. great job. Autumn is arriving in Boise and the colors are mesmerizing! I am busy painting new landscapes and posting them as soon as they dry. Please let me hear from you, any questions or comments are welcome. 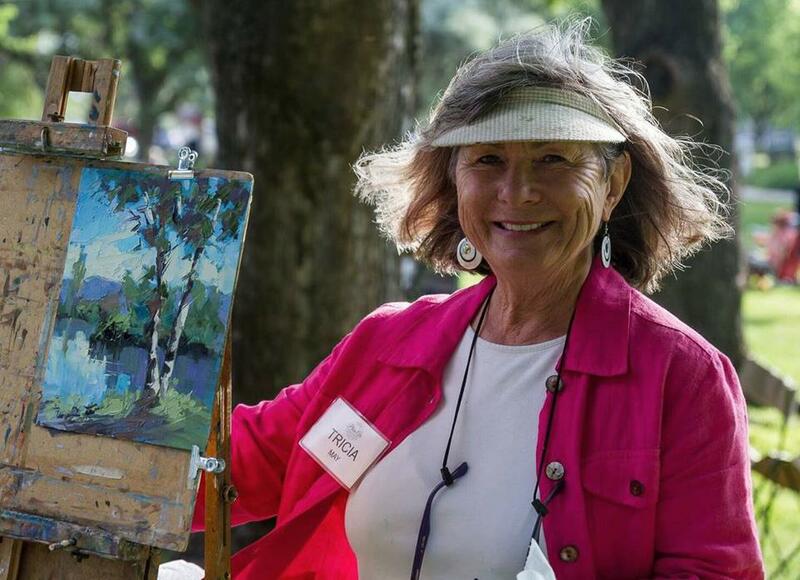 I am excited to participate in the Annual Plein Air Painters of Idaho's paint-out at Redfish Lake, Stanley, Idaho. September 3-5 twenty painters create artwork on location, while visitors look on. Wet paintings are displayed in front of Redfish Lake Lodge. It is great fun!